Santa Barbara Real Estate - 805-610-5403 - Santa Barbara Realtor w/ First Class Real Estate Services | Is Fall a Good Time to Sell a Home in Santa Barbara? Are you ready to sell now? If there are renovations that could add value to the selling price, you might want to wait until they are completed. Use the time to freshen up your home inside and out, and start packing away all that clutter that could give your home less appeal to potential buyers. Be a big fish in a small pond: Homes can be harder to sell in a competitive period. You could be one of ten homes for sale on your street in the spring, or the only one for sale in the fall. Controlling the timing can eliminate competition and help your home stand out to potential buyers. Show off your neighborhood: Neighborhoods do more decorating during the fall and holiday seasons. This can be attractive to families who want to move into a kid-friendly area. Include some tasteful decorations for your own home to show off its charming appeal on a year-round basis. Consider the financial risks: Nobody can really predict housing patterns into the spring. Interest rates are increasing regularly, which affects mortgage rates, and the mid-term elections might have an impact on the long-term economic outlook. You have to decide whether to take advantage of the current financial environment, or wait to see what it is like in the spring. Paperwork gets done faster: When everyone is buying and selling houses, there can be slowdowns in mortgage processing, inspections and paperwork completions. Fewer transactions mean faster completions. I am happy to help you sell or buy a home in Santa Barbara, Montecito, or one of the surrounding communities in the fall. If you have questions about real estate, don’t hesitate to ask our team of trusted professionals at Coldwell Banker. About Barbara Reaume: Santa Barbara real estate specialist, Barbara Reaume, operates out of the Coldwell Banker office at 3938 State Street, Santa Barbara, CA, where she helps clients buy and sell homes in Santa Barbara, Carpinteria, Montecito, Goleta, Isla Vista, Hope Ranch, Summerland, and the surrounding communities. 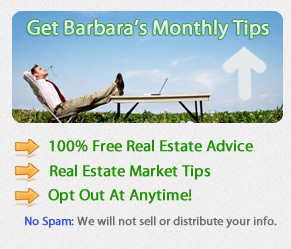 Visit the website at http://www.barbarareaume.com to buy a home in Santa Barbara, find home buying tips, or research house staging tips. “Like” the Facebook page for further insights on how to find a good real estate agent. Call 805-610-5403 to set an appointment or ask about homes for sale.